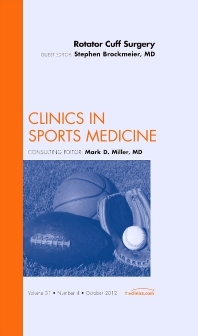 In this issue of Clinics in Sports Medicine, Dr. Stephen Brockmeier from the University of Virginia has assembled a group of experts to provide the latest updates on Rotator Cuff Surgery. This issue begins with the epidemiology and natural history of rotator cuff tears, followed by articles on: Imaging Evaluation of the Rotator Cuff; Arthroscopic Rotator Cuff Repair: Techniques in 2012; Biologics in the Management of Rotator Cuff Surgery; Outcomes of Rotator Cuff Surgery: What Does the Evidence Tell Us? ; Rotator Cuff Injury in the Overhead Athlete; Failed Rotator Cuff Surgery, Evaluation and Decision-Making; Revision Rotator Cuff Repair; Non-Arthroplasty Options for the Management of Massive and Irreparable Rotator Cuff Tears; and Reverse Total Shoulder Arthroplasty for Irreparable Rotator Cuff Tears and Cuff Tear Arthroplasty.